"Looking for a mirror in Crinan ?" "
"Mirrororworld have 1000's of mirrors and years of experience delivering mirrors to the whole of the UK including Crinan, We Supply and manufacture mirrors for the home and work place, whether your looking for a simple mirror for your bathroom, a cheval for the bedroom or a statement mirror for the lounge, Mirrorworld are the one stop mirror resource. With 1000's of ready made mirrors to choose from and an award winning made to measure service, it's easy to find that desired mirror here at mirrorworld. Check out our online store or try one of our free quote tools for a perfect custom made to your exact requirements. With a nationwide delivery service you really don't need to look further for a beautiful mirrors at a great prices." "Mirrorworld are the experts when it come to mirrors for Crinan, large or small, framed or unframed, customised and made to measure, we do the lot, whatever your needs look no further. check out our extensive on line catalogue or one of our free online designer tools, we know you'll find the perfect mirror for you. With free delivery anywhere in the UK mainland on orders of £50 your perfect mirror is just a few click away." 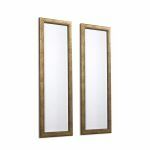 LF015 Just one of the great selections from our Classic range of mirrors and accessories. The unfussy, clean modern design gives this beautiful veneered oak mirror a timeless appeal. Let it grace your walls to create a space that is classic, functional and stylish. Crafted from one veneered oak, it's style and durability will complement any decor. an be used in both modern or traditional home to perfectly complement the interior whilst adding light and space to the setting. Supplied with Strap and hooks for simple wall hanging. At Mirrorworld we pride our selves in delivering quality mirrors and services throughout the UK, including Crinan. 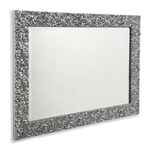 DR121 Just one of the great selections from our Designer range of mirrors and accessories. Ultra modern design sculptured profile mirrored silvered molten finished Frame with bevelled mirror. This wonderful Italian design frame fits perfectly in any contemporary surroundings and comes complete with straps and hooks for simple wall hanging. 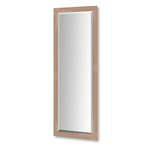 DR066 Just one of the great selections from our Designer range of mirrors and accessories. A duet of contemporary wall hanging mirrors. A stunning pair of contemporary designer framed mirrors especially sized to fit those awkward to fill places. Shown here above a side table this stunning pair of mirrors can easily be hung in a stepped pattern or for the more adventurous, in a landscape format. With a quality wooden frame and 20mm bevelled glass these ready to hang mirrors will make the perfect finishing touch to any home decor. Available as singles, doubles and triples in six beautiful designs. Passionate about our products and service, we want to help you make the perfect choice; so, in addition to holding a wide variety of mirrors in stock, we also offer a number of bespoke services. Perhaps you are looking to whet your artistic appetite or for our professional creative input; MirrorWorld’s accomplished craftsmen will work closely with you to create your own personal design, by hand at our workshop and deliver it to your Crinan home.